Habit: Annual 5--25 cm, glabrous. Stem: 1--many, erect. Leaf: basal (or few cauline, alternate); petiole 1--3 cm; blade 5--20 mm, 1--2-pinnately divided, segments 1 mm wide, linear, grooved adaxially. Inflorescence: +- scapose, head 1; involucre cylindric, base truncate; outer phyllaries 4--7, 3--6 mm, linear-oblong; inner phyllaries 6--8, 5--8 mm, ovate, acute, margin scarious; palea generally 5--6 mm, linear, free from disk fruit. Ray Flower: 5--8; ray 3--8 mm, oblong to obovate, reflexed. Disk Flower: 20--30; corolla +- 3--4.5 mm. Fruit: ray fruit 5 mm, obovate, glabrous, smooth, brown or tan splotched with brown, shiny; wing narrow; pappus 0; disk fruit 5--6 mm, obovate, tan splotched with brown, shiny, faces ascending-hairy, margins ciliate, hairs 1--1.5 mm; pappus scales +- 1 mm, obovate. Chromosomes: 2n=24. Synonyms: Coreopsis hamiltonii (Elmer) H. Sharsm. 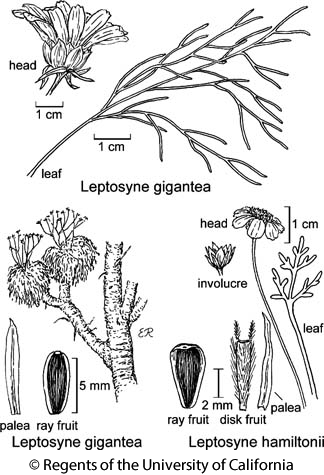 Citation for this treatment: David J. Keil 2012, Leptosyne hamiltonii, in Jepson Flora Project (eds.) Jepson eFlora, http://ucjeps.berkeley.edu/eflora/eflora_display.php?tid=30648, accessed on April 22, 2019.
e SnFrB (Diablo Range). Markers link to CCH specimen records. Yellow markers indicate records that may provide evidence for eFlora range revision or may have georeferencing or identification issues. Purple markers indicate specimens collected from a garden, greenhouse, or other non-wild location.